I was searching for some information — what proportion of Elsevier’s revenue is from journal subscriptions. So far, I’ve been unsuccessful with that (can anyone help? 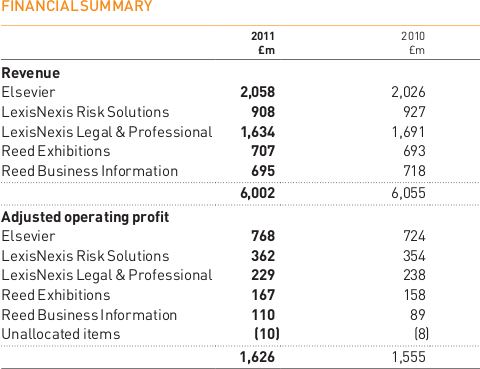 ), but along the way I stumbled across Elsevier’s Annual Reports and Financial Statements for 2011. As you can see, whereas in 2010 Elsevier were only able to generate an operating profit of £724M/£2026M = 35.7%, by sheer hard work and gumption they were able in 2011 to bring this up to £768M/£2058M = 37.3%. This continues a fine trend of five successive years of increasing profits — not just increasing in absolute amount (although that’s true, too), but increasing as a proportion of all revenue. So hats off to Elsevier, and to the valiant shareholders whose self-sacrifice allows us all to obtain more than adequate typesetting for our papers! Pay no attention to the moaning Minnies — this is an all-American success story! Isn’t https://svpow.com/2011/10/22/economics-of-open-source-publishing/#comment-11695 what you are after? Sadly not, Daniel. The total revenue and profit figures are a matter of public record (and I’ve mentioned them several times here and elsewhere), but the point has been made that some of my calculations are in error in that they made the assumption that all Elsevier’s revenue is from journals. I’m reading boring documents and emailing various people, trying to determine what the proportion is, but the closest I have come so far is that in the Science+Technology division it’s 78% — that’s one half of Elsevier, and I don’t yet know the corresponding figure for Health Sciences, the other half. Isn’t it more of a nominally-Dutch-but-really-transnational success story? Sadly, it may yet become an American success story. There are probably organisms in Congress more craven than Issa and and Mahoney, and Elsevier will probably court them heavily for the next go-round. To be clear: none of this is remotely over. Indeed, academia at large is just barely waking up to the fact that there is a fight going on at all. Matt makes a very important point here. The great danger is that we’ll all go “the RWA was defeated!” and relax as though the war is won. That defeat is great news, so far as it goes; but all it means is that this particular attempt to annex yet more rights at the expense of researchers and our broader society didn’t succeed. It doesn’t mean they won’t come back and try again, and more important still it means that our “win” only leaves us where we started. Actual progress would mean getting the FRPAA passed — extending the NIH’s public-access policy to the US Government’s other large funding agencies. We should be putting at least as much energy into passing that as we did into opposing the RWA. Unfortunately, we bore quickly — even I get bored of writing about this stuff all the time and long to concentrate on some nice, juicy sauropods instead! — and I worry that, by banging on about the FRPAA. I’ll exhaust whatever welcome I may still have with my colleagues. none of this is remotely over. Indeed, academia at large is just barely waking up to the fact that there is a fight going on at all. Reed-Elsevier’s P/E ratio, incidentally, is 16, which is normal — the market thinks the party is not over. Actual progress would mean getting the FRPAA passed — extending the NIH’s public-access policy to the US Government’s other large funding agencies. It’s probably easier to convince the agencies than to convince Congress. Since the NIH adopted the policy on its own, other agencies may be amenable to doing the same. German mainstream media covers the boycott.